I don’t know how other bloggers do it where they push out exciting, creative content several days a week, sometimes, more than once a day. Even with some patched together work schedule that doesn’t fully resemble “full-time” yet, I still require a few days to get one project and post together. Part of the reason belongs to the great Minnesota winter that provides only a small amount of daylight, and even less time shining through my kitchen and living room windows. Which means that if there are beautiful pictures to take, it has to happen between 11am and 2pm or it’s a total disservice to the efforts of the recipe or the project. Indoor light is not a photograph’s friend. Needless to say, this is a tight window to work within and a really strict schedule to try and keep. I’m saving up for a digital fluorescent lamp that will allow me to shoot photos even as the outside light grows dim, but until then, I’m working with what I’ve got: big clean windows, shade from an overgrown oak tree in my neighbor’s yard, sunshine peeking through from the Northwest, and foot-upon-foot of bright white snow that acts as a natural reflector of what sunlight there is. I’ll get by. Sometimes, I’ll start a project, like these simple, upcycled jars for my bathroom, and before I know it, dinner is being prepped, or planning for tomorrow’s lecture gets underway, and before I can snap a photo and fill you all in on what I’ve made, they get put into use – worked into the day-to-day life that’s happening here. 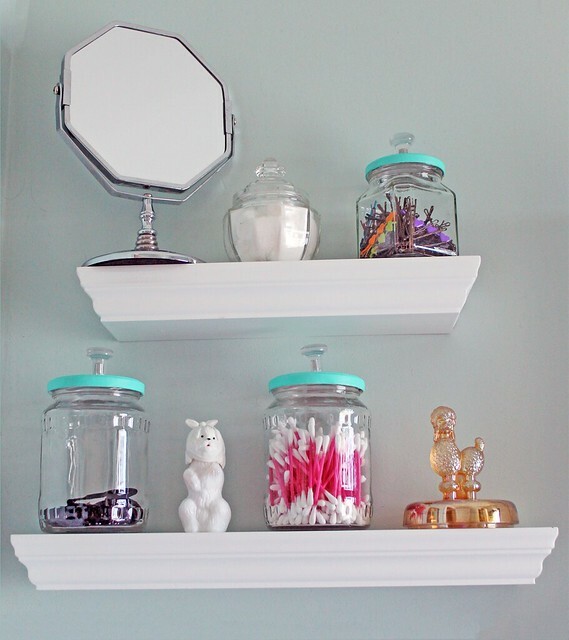 I put these jars together in October or so, fresh off the renovation madness, to fill the new shelving in my bathroom and find a home for small items like cotton swabs, bobby pins, and hair elastics. 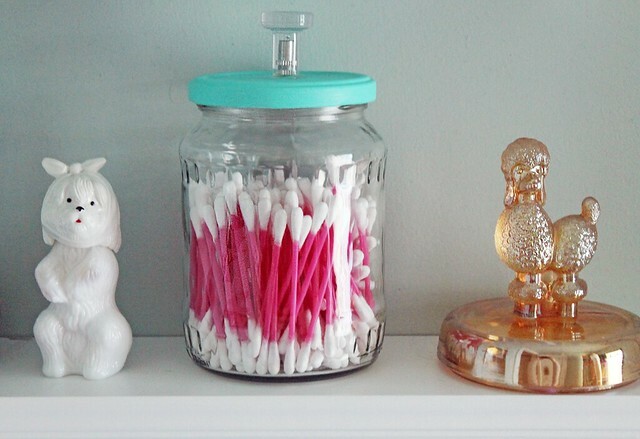 I tend to hoard uniquely shaped glass jars for when I make a vinaigrette or want to send a visitor home with a special treat, so these cute ones were already tucked into my cupboard awaiting a facelift and, in no time, flat they were oh-so-simply transformed into colorful, functional bathroom storage! In some ways, it feels like putting a tutorial together for these is insulting, as all they required was a little paint and a little glue, but for the easily daunted among us, I’ll post one below. I think of these jars as less a formal craft and more of a quick attempt of making something beautiful, functional, and inexpensive out of nothing. Even something as ordinary and uninspired as a pickle jar! More things in life should be this satisfying and quaint. Note: While these jars have knobs on them, their purpose is more decorative than functional, i.e. I glued mine on. I open the jars with a regular twist on the rim of the lid. If you want to use the knobs as intended, a drill & a screwdriver will get you there nearly as quickly. Fill your sink with hot soapy water and submerge jars and lids. If jars have a label, use a fork to carefully pierce the label in several spots before adding the jar to the water. Jars that have held strong-smelling foods, such as pickles, roasted red peppers, etc., may need an extra bit of soap swished around inside them, as well as rubbed into the inside of the lids, or just a second soak altogether. Allow the jars to soak for about an hour, peeling off any labels that will budge after a half hour, and using a sponge to remove all glue residue after the 60 minutes has passed. If the glue is giving you a hard time, you can soak the jar problem-side down in a few inches of hot water, dish soap, and a few tablespoons of white vinegar. Another option is to try rubbing any kind of regular kitchen oil onto the glue and then buffing it off with a rag. If you use the latter technique, be certain you re-wash your jars and allow them to dry again before proceeding. After your jars are clean and dry, apply a layer of acrylic paint to your jar lids and allow to dry. Repeat for 3 coats or until desired color is achieved. Allow the lids to dry completely, then apply a small bead of hot glue to the middle of the jar and press and hold your drawer knob on to the lid until it is secured. Allow to dry and cool. 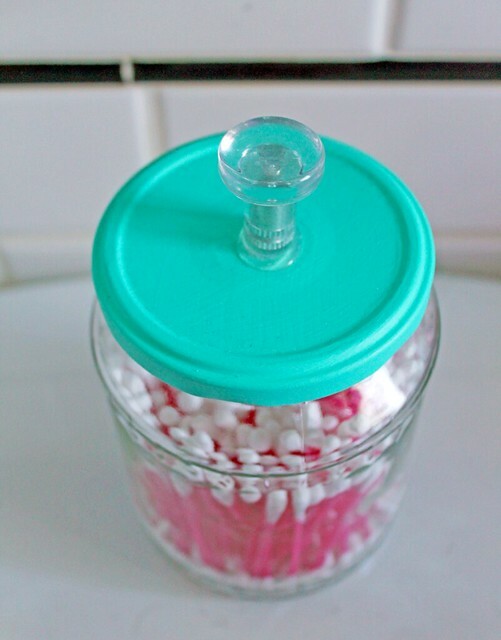 Fill jars with your desired contents and affix the associated lids. For added charm, apply a strip of washi tape across the center of the lid, or on the front of the jar, to serve as an easy, breezy label. This works best for jars not intended for the humid environment of the bathroom.